In Benedict XVI’s Final General Audience on February 27th, he reflected upon Mary’s role as Mother of the Church. In his February 11th address, Benedict implored Mary’s guidance and maternal solicitude for the Church, but on February 27th he invoked Mary under the title, Mater Ecclesiae. Coincidentally, Pope Benedict will retire to the Mater Ecclesiae monastery inside the Vatican, so this title of Mary will become a part of his daily life, once he makes his final move to the monastery. Benedict aptly calls Mary the Mother of the Church, but in his invocation he prays that she will accompany the entire ecclesial community. Yes, Mary is the Mother of the Church, but she is also a pre-eminent member of the Church, as John Paul II reminded us. Mary as mother and member, journeys with the Church, just as she journeyed with the infant Church after the Resurrection. Because of her role, this is why, as Benedict says, we entrust ourselves to her with deep confidence. We trust in Mary’s intercession. Perhaps this is best exemplified when praying the Hail Mary, “pray for us now and at the hour of our death.” With deep confidence we entrust the hour of our death to Mary, hoping that as we pray that line so often, that she will indeed be our final intercessor at the hour of death. 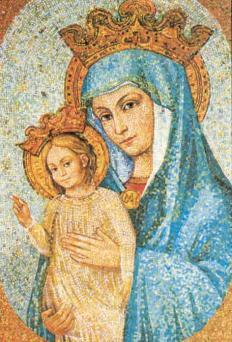 With Benedict XVI, Pope Emeritus, let us pray that Mary will accompany the pilgrim Church on earth.